The Berkshire Food Project was started by Williams College students in 1987. They recognized that there had been a shift in the region from a industrial to a service economy, resulting in unemployment and under-employment. Many young people left the North Adams area in search of jobs, leaving older family members in the community who lacked the job skills which emerging technological firms would require. 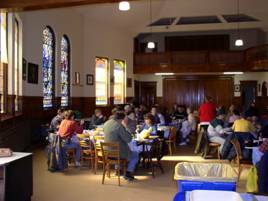 Elizabeth Wheeler, then pastor of the First Congregational Church in North Adams, offered the Project a place in which to prepare and serve free meals. Initial funding was provided (and still is) by a monthly meatless meal at Williams. The College donates one dollar to the Project for each student participant.